A major financial company’s self-service system was outdated and had created more work for consumers and contact center agents. With the help of EPIC Connections, the company simplified their IVR, saving 11,600+ agent hours annually. With the vision of redesigning the IVR system to be more effective and user friendly, executives had invested in a modern IVR technology platform. Now, they needed a partner to design the call flows using self-service and information capture best practices, and their IVR technology provider suggested EPIC Connections for the work. During initial conversations, executives challenged EPIC’s industry veterans to design a solution that would free up agents and allow customers to quickly self-solve account inquiries as well as other basic functions. Simplify the IVR: IVR improvements will capture alternate caller data to boost security authentication rates. By proactively offering high-demand information to customers, the system will contain more calls. Detailed interactions will also improve call decisioning. The suggestion to add natural-language, speech recognition technology will further enhance self-service in the future. Engage the Customer: New capabilities will intelligently offer service options based on customer data. This will both optimize service and enable sales by routing high-value calls to agents for cross-selling and up-selling. Enhance Service Interactions: IVR improvements will match calls to the most skilled agent and serve customer data to the agent desktop, reducing repetitive customer questioning and call handling time. 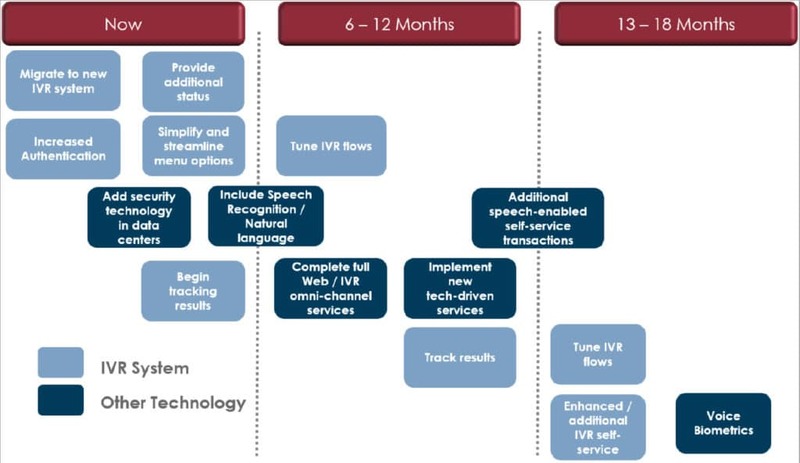 EPIC’s analysis also offered guidance in how to incorporate security automation technologies into the IVR system and provided executives with direction in selecting a speech recognition partner. A phased implementation approach was recommended to mitigate potential risks, allowing for collaboration and alignment across teams. With EPIC’s IVR call flow design and comprehensive plan of action, the company was armed with a step-by-step process to turn their new IVR technology investments into real results. Once implemented, the solution is expected to increase customer satisfaction and IVR call containment through the increased caller authentication rates. Improving caller authentication will give customers access to additional features in the IVR, resulting in higher call deflection. It will also allow information-only or single transaction users to self-serve without agent interaction. Finally, sharing high-demand information will reduce call handling times by proactively resolving needs prior to agent transfer.